Culinary Destination by World Travel Awards: Peru Wins! The World Travel Awards serves to acknowledge, reward and celebrate excellence across all sectors of the global travel and tourism industry. They recently announced their awards for many categories including the World’s Culinary Destination of 2012 – and guess who won, you got it – PERU. And Peru had to beat out some really tough competitors with some amazing cuisine. The other nominees were Australia, China, France, India, Italy, Japan, Malaysia, Mexico, Spain, Thailand and the good ole USA. I think it was the guinea pig that put Peru over the top with the decision committee. 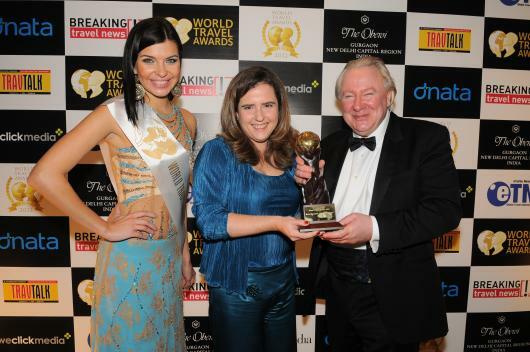 Mariella Soldi, Director of Peru’s Country Image was there to accept the award from the President of the World Travel Awards, Graham Cooke. Machu Picchu also won the award for World’s Leading Green Destination. Peru has once again proven that it deserves to be a top vacation destination and has a lot to offer to everyone. And Alpaca is here to make sure that vacation goes down in the books and wins your award of best vacation ever. We hope to see you soon in Cusco.